Welcome to the Be Irresistible' Library! Below are a selection of courses from James' collection. This is the ultimate relationship resource, ready for you to access at any time. ... And then turn it on its head. So that the problem becomes part of the solution. The secret is to channel his existing drives so they serve your relationship. Learn how to channel his secret obsession. Start reading now! 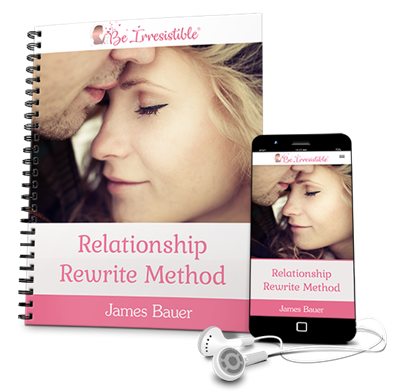 The relationship rewrite method shows you a simple path to follow when your man seems to be pulling away. Even if he is currently refusing to speak with you, this method will grab his attention. You'll learn how to touch his emotions through special compliments that open his heart to you again. 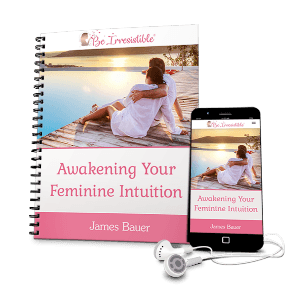 James teaches you how to tempt him to take a step closer, of his own free will. The method works by drawing out the best in him. Then you fan the embers and rekindle the flame of his desire to claim you as his own. To be truly irresistible to a man, you MUST understand the way feelings of love and respect get entangled in a man's mind. The way men experience a relationship has far more to do with subtle forms of respect (or lack of respect) than you would ever imagine. Feeling loved simply does not happen without a foundation of respect. After consuming this short-guide, you will possess a secret that men cannot express well because it is so foundational to their view of the world that they don't even realize it is there. Relationship advise can be extremely valuable, but no two relationship situations are alike. In the end, you will rely more on your own natural intuition about relationships than anything else when deciding who to date, who to dump, what to say, and how to make him fall for you. This unique training course was designed to magnify the tremendous potential that lies dormant within your own intuitive wisdom about relationships. After completing this course you will know how to tap into your intuition at a moment's notice when facing a difficult and unique relationship scenario. Plus, you will feel far more confident about your relationship decisions. You will also learn how to tap into a deep well of creativity and insights that will dazzle any man you set your sights on.